Sweet Caroline - Trinity Tiger Tones's Acapella Cover of the Neil Diamond song. The Longest Time - Trinity Tiger Tones's Acapella Cover of the Billy Joel song. What do you think it means to "go to space"? A common misconception is that going to space is simply to fly very high up. That's not entirely true. The Fédération Aéronautique Internationale (FAI) defines the boundary of space as the Kármán line at 100 km above Earth's sea level. Most satellites are reside in low Earth orbit (LEO) with an altitude of between 160 km and 2,000 km. The International Space Station (ISS) maintains an orbital altitude of between 330 km and 435 km. Granted, 100 km is high, and it takes a lot of energy just to get to 100 km above sea level. But unless you are travelling very fast horizontally (at orbital velocity), you are going to fall back down to Earth. See xkcd what-if #58. Don't believe how hard it is to get into orbit? Go download the free trial of Kerbal Space Program (KSP) and attempt to get a rocket into orbit. KSP is a space simulation game with a pretty good physics engine, and it's very educational in relation to orbital mechanics. Here's another relevant xkcd comic. So how do you know how much velocity do you need to achieve orbit -- without studying aerospace engineer and becoming a rocket scientist? Actually, you can figure out how to calculate orbital velocity with a little bit of high school maths and physics. Here is a thought experiment originally written by Isaac Newton. Imagine a cannonball being fired out of a cannon from a very high mountain, where there is no air resistance. If not for Earth's gravity, it would travel in a straight line forever. Earth's gravity will cause the cannonball to fall towards Earth at a constant rate of acceleration -- the acceleration due to gravity. When the cannonball is fired normally, the cannonball will drop to the ground some distance away from the cannon. When the cannonball is fired at a higher velocity, the cannonball will fly even further before hitting the ground. If you keep firing the cannonball at higher and higher velocity, at a certain point, the cannonball will be falling as quickly as the surface of Earth is curving away from the cannonball. At this point, the cannonball will have reached orbital velocity. Since we have already assumed no air resistance, there is no force acting horizontally against the cannonball, so horizontal velocity will remain constant (Newton's First Law - Law of Inertia). The vertical velocity of the cannonball, however, will be affected by Earth's gravity - and will be increasing at the rate of acceleration due to gravity (approx. 9.81 m/s 2 ). Let's allow the cannonball to fall an arbitrary distance of 1km. How long does it take for the cannonball to fall 1km under gravity? where s is the distanced travelled from the point of origin from an initial velocity u in time t under constant linear acceleration a.
where s is the distance fallen and a is the acceleration due to gravity. So, in 14.28 seconds, the cannonball will have dropped 1 km towards the centre of Earth. Now, how much distance must the cannonball have travelled horizontally in that time in order for the surface of Earth to have curved away from it by 1km? To calculate this, we will need to use Pythagoras's theorem. Because cannonball's horizontal velocity and vertical velocity can be treated as independent vectors, let's imagine the cannonball falling to be a 2-step process. In 14.28 seconds, the cannonball travelled horizontally for distance d, then it dropped 1 km (labelled as drop height h in the diagram). Earth's radius is approximately 6371 km, and assume we are firing the cannon at an altitude of 100 km. In the time it takes for the cannonball to fall 1 km, at orbital velocity, the cannonball will have to had travelled 113.77 km so that Earth has curved away from it by 1 km. The orbital velocity can therefore be calculated by dividing that horizontal distance by the time it must have taken to cover that distance. So we can estimate the orbital velocity to be 7.97 km/s - which is fairly close to the actual orbital velocity of 7.85 km/s as determined by orbital mechanics. You have just calculated the orbital velocity of an object in a circular orbit around Earth at 100 km altitude! I have built an Excel model and a Python script that you can use to calculate orbital velocity using the method described above. 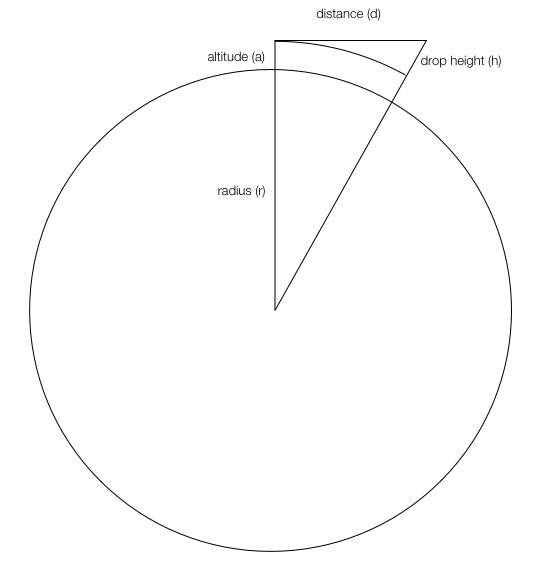 In the orbital velocity calculators, I have scaled the acceleration due to Earth's gravity by the altitude of the object. This accounts for the effect of Newton's Universal Law of Gravity -- which states that the gravitational force is inversely proportional to the square of the distance between the two bodies. Given Newton's Second Law ( F = ma ), the acceleration due to gravity is inversely proportional to the square of the distance between the two bodies. You can find my orbital velocity calculators on my Github repository. So... just how fast is orbital velocity, really? What does it mean to get up to approx. 8 km/s? See xkcd what-if #58 and try getting into orbit in Kerbal Space Program (KSP). This was the result of an idea I had in the shower one night. I remembered Neil deGrasse Tyson using Newton's cannonball to explain what it means to go to space, and I thought "Can I use that idea to calculate orbital velocity without learning calculus and orbital mechanics?" It may seem easy and straightforward when you read this, but it wasn't when I first attempted to solve this problem. It took me a couple of hours of thinking and calculating to figure out how to (correctly) solve this problem. But I love solving problems like this - it's fun and satisfying when you figure it out! It turns out, though, you don't need to learn calculus to calculate orbital velocity using orbital mechanics - but it's not as intuitive to understand what the calculations mean. To me, Newton's cannonball is a fantastic way to visualise and intuitively understand orbital velocity.